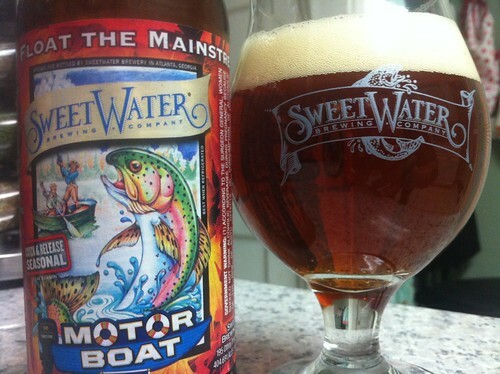 SweetWater Motor Boat | Drink. Blog. Repeat. It’s no secret that I love SweetWater. They’re the reason I started this blog in the first place and the reason I got into craft beer. And as the seasons change, the Atlanta brewery puts out a new entry in its rotating Catch & Release Series. Motor Boat (what a great name) is their fall seasonal – “Leaf Season,” as they call it – and one of my favorites. It’s an Americanized ESB that takes the traditional British style and gives it a dose of dry-hopping, preserving the malty backbone and finish but with a bigger and more bitter bite. Motor Boat pours a crystal clear copperish brown. (Fallen leaf brown, maybe?) There’s a finger and half of head that sticks around for a while. Some very mild lacing and alcohol legs. There’s a very floral and juicy nose. The dry-hopping is extremely prevalent as you get a big, crisp hop bite. There’s a lot of tropical fruit on it, too. Big orange, mango and papaya notes. There’s a very slight pine to it. The sweet caramel maltiness is also prevalent. On the front of the tongue is a very slight hop bitterness. It’s followed with a medium body mouthfeel but a big, wet, juicy fruit finish. The tropical fruits really pop on the end. That slight pine is also there. The malt backbone adds to the very smooth taste and a hint of caramel on the finish. It’s all incredibly smooth and really easy to drink. Motor Boat is one of those beers that really fits the season. The ESB style gives it a really clean, mellow taste, something accentuated by the fruit notes from the hops. But the dry-hopping gives it just the right amount of bite, but not so much to mask the sweeter notes.